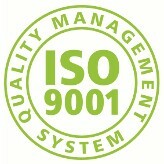 ISO 9001:2008 is an international standard describing the aspects of a company's quality management system that will ensure the products or services provided are of consistently high quality. It describes how the principles of meticulous monitoring of individual activities and processes within an organisation should be implemented by means of compliance with documentation supervision processes, resource management and systematic measurements of customer satisfaction and quality. Maintaining the standard proves our continuous endeavour to meet the needs and expectations of our customers, along with providing consistently high quality of our translation services, executed in accordance with the norms broadly approved by the translation market.